This same species has other varieties as well, such as the Anaheim chilly often used for stuffing, the dried Ancho chilly used to make chili powder, the mild-to-hot Jalapeño, and the smoked ripe Jalapeño, known as a Chipotle. In Australia, New Zealand, India, Singapore and Hong Kong, heatless species are called "capsicums" while hot ones are called "chilli/chillies" (double L). 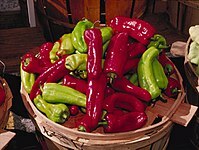 The term "bell peppers" is rarely used, usually in reference to C. annuum and other varieties which look like a "capsicum" or bell but are fairly hot. ↑ Mason J.R. et al 1991. Journal of Chemical Ecology. 17, 2539–2551. ↑ Norman D.M; Mason J.R. & Clark L. 1992. The Wilson Journal of Ornithology 104, 549–551. ↑ Emma Cale (2013). "Chili Peppers and Prostate Cancer". Livestrong.com website. Retrieved 8 April 2014. Wikispecies has information on: Capsicum. This page was last changed on 11 March 2019, at 01:11.